The Betsoft game designer has done it again — they’ve created a slot machine that draws the player into the game’s storyline while he competes for generous prize rewards. 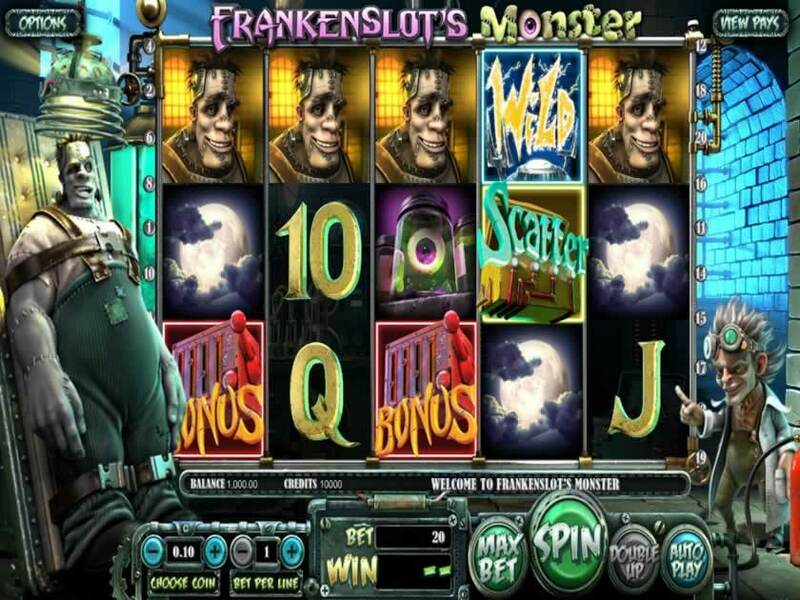 Frankenslots Monster is based on the intriguing tale of Frankenstein, a scientist who creates a grotesque creature who is capable of great acts of violence. Frankenstein allows his creature to roam the countryside where he wrecks havoc and destruction. In the Frankenslots slot machine you’ll have the chance to follow the young scientist, Viktor Frankensein, his creature and other story icons as they spin on the reels to complete paylines and deliver payouts. Frankenslots Monster Slot was created by Betsoft, one of the world’s most popular and well-regarded gaming designers. Betsoft offers a safe and secure gaming environment where players can be assured that they’ll be able to enjoy fair and protected gambling fun. The game utilized a supervised random number generator that offers a confirmed win percentage. When you play this game you can play at a low betting level with as little as a one-coin bet of as little as .02 or you can move up to higher betting activity that allows you to wager up to 5 coins. The $5000 maximum jackpot makes this one of the best games for beginning gamers and advanced gamers alike. There’s an additional free play option. If you want you can compete for free when you play Frankenslots Monster Slot. Just press the “Start Playing” button and start the reels spinning with no deposit requirement. Casino advisors suggest that you play a new game or review an old favorite by playing in the Free Mode before you add a wager to start playing for real. The symbols that you’ll see on the reels when you play the Frankenslots Monster slot machine include Dr. Frankenstein, the monster, a full moon and Wild and Scatter signs. There are also traditional slots letters and numbers to fill in the reels and allow you to complete more paylines. As the reels spin you’ll see the monster clapping his hands in the corner as lightning strikes and Dr. Frankenstein nods in appreciation for the payline wins. The WILD symbol is the WILD sign. It replaces any other symbol on the line to create additional completed paylines and award added payouts on those wins. If you achieve 5 scatters on an enabled payline you’ll win 1000 coins. You can move your payline bets up and down throughout the game by clicking on the “+” and “-” signs. When you land on 3 of the Bonus symbols you’ll trigger the Bonus Round. The Bonus symbols appear on the first, third and fifth reels only. When the Bonus round starts you’ll take the monster an electric jolt. Adjust your lines, start the shot and aim for the bonus jackpot prize. If you hit the bonus you’ll achieve a multiplier. The random multiplier value can go as high as 25x. When you land on three of the scatter symbols, which appear scattered on the second, third and fourth reels, you’ll trigger the Free Spins Round. When the free spins are triggered, you will be awarded 8 Free Spins. Between 1 and 3 random symbols will turn into Wilds during the free spins. The wilds then substitute for other regular game symbols and deliver wins. The free spins retrigger if you land on 3 more scatter symbols during the free spins round. When 3 scatters appear on a free spins you’ll be awarded 8 additional free spins. You’ll enjoy a monsterous good time as you play the rewarding Frankenslots Monster Slot on your preferred gaming device.